How are we all today? Ready for Christmas? Nope me neither. Heres a thought for you. Is there anything more disheartening than reading a statement about how much your own mother hates you? Yep. Reading a whole book about it. On returning back to my main abusers home in late October i managed to not only find piles of personal diaries, letters and note books but i managed to bring them home too. Honestly,it took me a little time to finally bring myself to go through them. I had already had a sneaky peak at the contents but knew id need to sit down with a strong tea to read the rest. Hate – feel intense dislike for. Synonyms: loathe, detest, dislike greatly, abhor, abominate, despise, execrate, feel aversion towards, feel revulsion towards, feel hostile towards, be repelled by, be revolted by, regard with disgust, not be able to bear/stand, be unable to stomach, find intolerable, shudder at, recoil from. 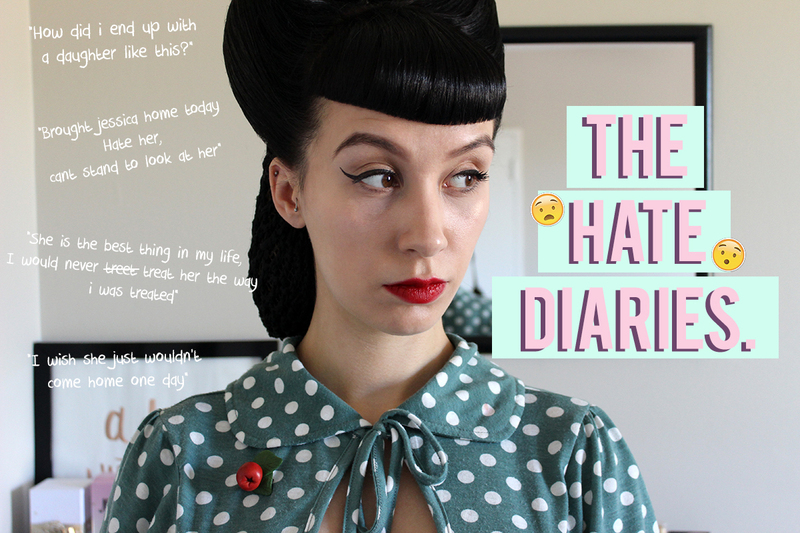 The book id like to name ‘The hate diaries’. Pages and pages of hate. Pages and pages of who had done things and why hate was a result of that situation. Pages with dates and times and someones actions and then thoughts and feelings on the subject. (Obviously in hateful context, you get the gist) Hate not just being the word that i would use, but the exact word they used too. For me, trying to get my head around that process is baffling. Hate for me, well lets just say i don’t understand it. Ive never had that true feeling of hate. Ive been in many situations where ive heard friends say ‘GOSH I HATE HER,ERGH’ when there had been disagreements. Due to me having the personality of an egg when approached with a situation that hate would normally be the result of i just get deadly confused and instead of hate either get upset or just spend a week of sleepless nights thinking, why did that just happen? Hate is a horrible horrible word and i avoid it at all costs. Possibly because of how i was brought up with it so freely strung around or maybe because its just literally, a horrible thing. Can anyone do anything that bad in life that you can use hate as a word to justify it? Hate to me, is a poison. It consumes the body of all emotions and the rational mind is put to one side to not only cause disruption to other lives but those ‘hating’ too. I guess this is that real “I knew it!” time for me. I thought i had a rough idea of what had happened to cause my abuser to go down the path she had but reading the diaries only confirmed what i had thought all along. The book went right back to childhood memories oddly noting things that had happened and how the memories had stuck. The books also not only expressed hate towards people but it bounced backwards and forwards between how wonderful a person was to that dreaded hateful attitude. It showed hate wasn’t the true emotion and bouncing backwards and forwards to me,indicated confusion,heartbreak and a sense of being lost. It was all too much hurt leading to too much hate. A hurtful situation and not knowing how to deal with it. Irrational thoughts all wrapped up in a warped and irrational thinking process. How do you deal with these situations? Do you ever feel you hate people and have you thought of it from the aspect of hurt? Lets just love each other aye? Question Time! – How did you heal from your abuse and what helped you?